Mary Bradach is the Director of Gift Planning at the Community Foundation. In this role, Mary is focused on business development, specifically responsible for developing new and deepening relationships with professional advisors and their clients. She is the primary point of contact for professional advisors who work with the Community Foundation to provide their clients with expertise in charitable giving. 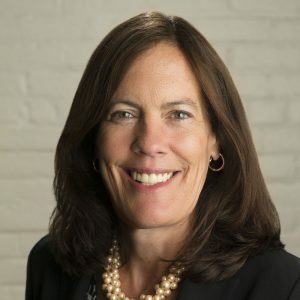 With almost three decades of experience in financial services, she works alongside accountants, attorneys and financial advisors to provide strategic and comprehensive charitable planning programs best suited to meet their clients’ needs. Prior to joining the Community Foundation, Mary worked for more than 25 years in New York City for AXA Equitable, a global financial services company. Here, she held several senior management positions including Senior Director and Vice President of Wealth Management where she oversaw sales, marketing and technology support for more than 4000 financial advisors and sales managers. During her expansive career at AXA, Mary also led teams focused on business development, financial planning, risk management, compliance and controls and corporate strategy. Mary received her B.S. in Economics from Stanford University where she was a member of Stanford’s Division I Women’s Basketball team. She holds FINRA Series 6 and Series 26 licenses, and is pursuing her Chartered Advisor in Philanthropy (CAP) designation. Mary serves as the Treasurer of the Park School Parents Association and also volunteers for Junior Achievement, a national nonprofit organization educating students about finance, entrepreneurism and wealth management.